The presentations are generally held in the Rhineland Room in the Crossings building at the above address. Parking at the Crossings is limited. The next best area for visitors to park is in the staff parking area. There is a friendly shuttle running from that parking lot to the Crossings building. 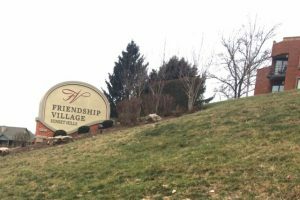 To get to the staff parking area, turn off of Gravois Road into Friendship Village, the main entrance to Friendship Village (photo 1). That entrance drive is called Pointe Drive which turns into Village Circle Drive at the top of the hill. You will see a Village Circle Drive sign on the decorative rock (photos 2 and 3). Turn right at the rock sign and then immediately turn left. Continue straight to the next stop sign where there is also a sign for staff parking pointing to the right (photos 4 and 5). Turn to the right there and go to the staff parking lot. Park in the staff lot, and call for the shuttle (photo 6) if it is not sitting there waiting. On the sign, there is a phone number to call, 314-270-7200. Tell the driver you are going to the Crossings building (photo 7). On Thursdays, Darryl should be your driver. Allow about 10 minutes to take the shuttle and get into the Rhineland Room in the Crossings building. It is quick and efficient.